[Strasbourg] : [Printer of the 1483 'Vitas patrum'], 7 March 1483. Collation: [1¹⁰ 2-28⁸ 29¹⁰ 30-32⁸]: 260 leaves, leaves /1 and /8 blank. Colophon (leaf /7v): "Anno d[omi]ni M.cccclxxxiij. nonas vero Marcij. ob b[ea]to[rum] pat[rum] p[ro]fectu[m] vita[m] heremiticam degentiu[m]. gesta quo[rum] haud i[n]merito memorit[ur] sunt [con]me[n]danda Opus Vitasp[a]t[rum] appelatum insigna. a q[ui]spl[ur]imis excerptum codicib[us]. p[er] sacra[rum] scriptuar[rum] viros ad modu[m] p[er]itissimos orantu[m]. Finit felicit[ur]." De laude et effectu virtutum is a variant recension of the Admonitio de profectu animae attributed to Adalgerus (cf. 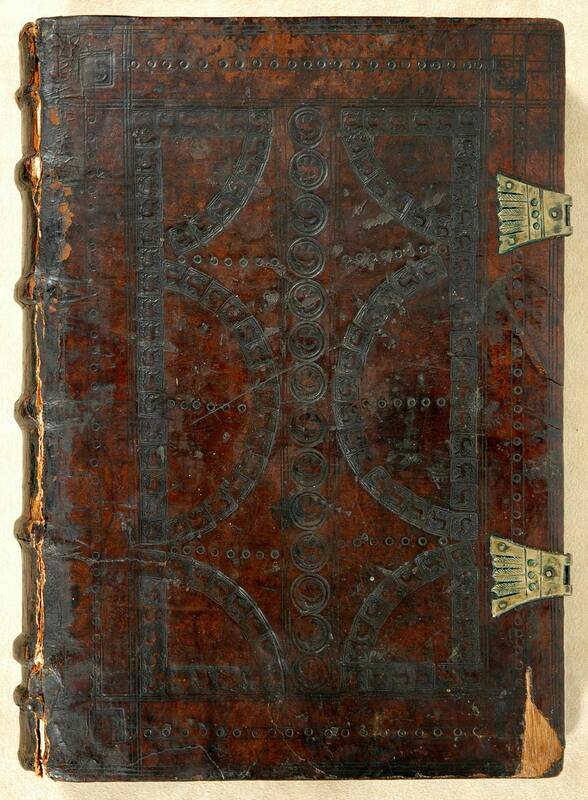 Needham, Counting Incunables, 524-26). 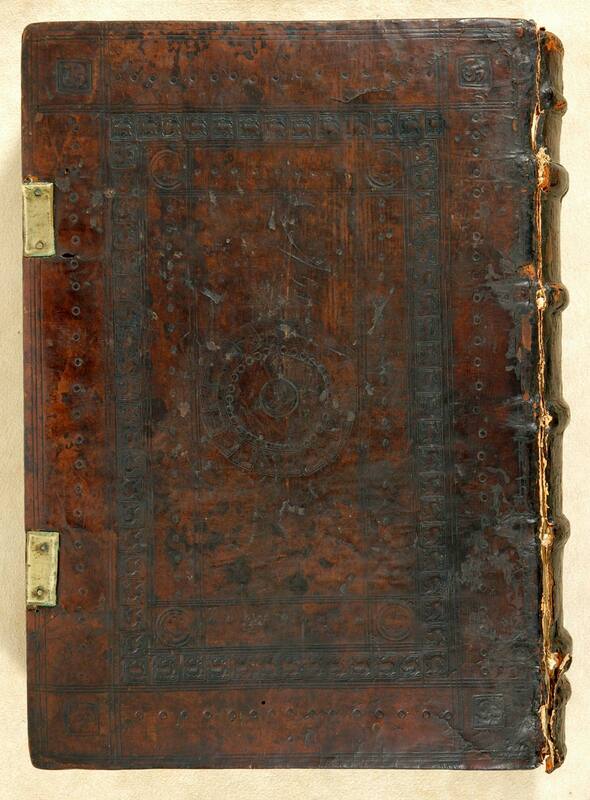 Includes Jerome, De laude et effectu virtutum (leaves /7r-/7r) and Pseudo-Macarius, Epistola ad monachos (leaves /7r-v). Printed in types 1:180aG (headings) and 2:90G (text) assigned to the eponymous press. 15th-century English blind-tooled dark brown calf over wooden boards (30 x 21 cm), sewn on 5 supports, possibly bound in Oxford. Stamps unidentified; include: 15mm round stamp of creature with long beak, 9mm square stamp of four-legged beast eating its own tail, 12mm square stamp of dragon facing left, and 3mm circle. Plain paper fly leaves are integral to the printed book block; contemporary English manuscript waste mentioning Romney of Lyde removed from front pastedown (in item folder). Plaited cord endbands. 2 clasps, both wanting; wedge-shaped catch plates (31 x 32 mm) with incised feather motif. Blind-tooled title on spine. Hand decoration: Rubrication unrealized. Annotations: Manuscript quire signatures in bottom right corner (+ a-z [et] [con] [:·] est Amdū aa-cc). Shelf mark label, unidentified: oval (31 x 36 mm) with blue floral frame and 3 lines, shelf mark "W"; George Dunn (1864-1912), Woolley Hall, Maidenhead, booklabel (front pastedown); his sale, Sotheby's, 22 Nov. 1917, lot 1192, to Bernard Quaritch; J.P. Morgan, Jr. (1867-1943), purchased from Lathrop C. Harper, Dec. 1923.